I collaborated with Lilin Tseng (http://furrymemory.com/blog/hang-it-up-show/) on this piece called "Hand Ball". Lilin provided the cast resin hands which she sculpts...makes molds...then casts. I made the copper ball and painted and attached the hands. 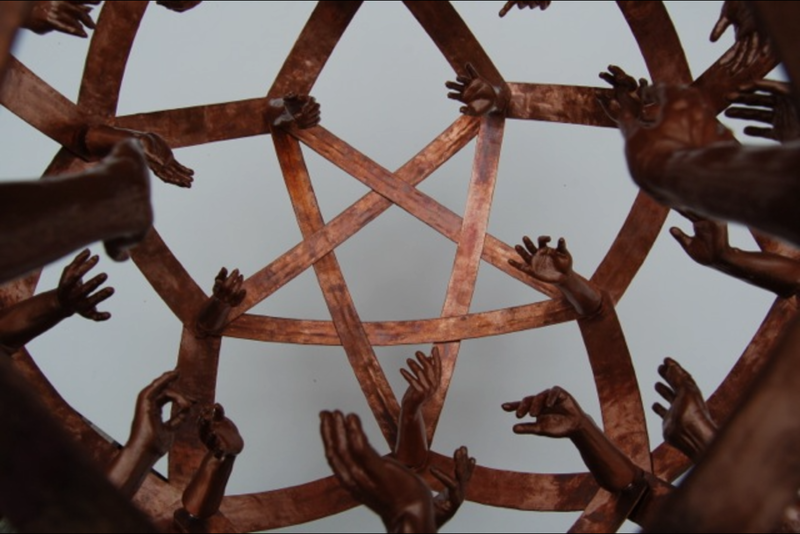 "31 hands reaching towards the sacred geometrical point of nothingness, manifesting from an elemental (copper) spherical rhombic triacontahedron, with a force channeling pentagram inset. The divine proportions of the hands reflect the phi relationships within the golden rhombi, and pentagonal geometry, demonstrating the universal fibonacci sequence." It was for the “Hang It Up” group show at Salmon Falls Artisan Showroom, Shelburne Falls, MA.